Norwegians have long had to deal with food and beverage prices that are as much as double those in neighbouring Sweden. Now the spotlight has turned to pharmacy prices that can be triple those for exactly the same products south and east of the border. It’s part of Easter week traditions in many Norwegian families to take a drive over the border to Sweden for some holiday shopping. They return with cars full of much lower-priced food and drink that more than justifies the cost of the trip. Sweden’s state-controlled liquor stores (Systembolaget) also stay open on Holy Thursday, while Norway’s Vinmonopolet is firmly closed. Now it’s likely that many more Norwegians will also be popping into Swedish pharmacies while “abroad,” after newspaper Aftenposten reported on the major difference in prices on unregulated non-prescription products. Aftenposten compared prices in a sample shopping basket of 14 items at an Apotek 1 pharmacy in Oslo (the largest chain in Norway and viewed as representative for Norwegian pharmacy prices) and the Swedish Hjärtat pharmacy in Nordby, just over the border at Svinesund. 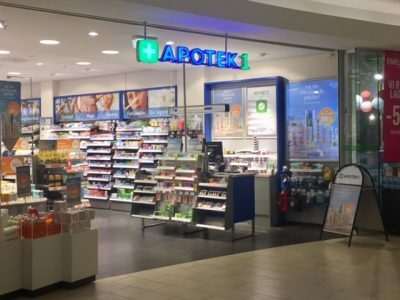 Aftenposten noted that none of the products it compared was subject to any special offer and the Swedish pharmacy stressed that its prices at the Nordby Shopping Center are the same as those at all its outlets in Hjärtat’s chain nationwide. Aftenposten’s survey showed that the price of a 75ml tube of Sensodyn toothpaste, for example, cost NOK 62 at Apotek 1 in Oslo and just NOK 28 (after being converted from Swedish kronor) at Hjärtat in Sweden. A 500-gram container of Canoderm cream that costs NOK 499 in Norway cost NOK 286 in Sweden. Otrivin nose spray cost NOK 31 in Sweden, compared to NOK 65 in Norway. The list went on. One item purchased by many of the Norwegian customers at Hjärtat in Sweden was Nicotinell mint-flavoured nicotine chewing gum. A package of 204 pieces costs NOK 460 in Norway, but just NOK 343 in Sweden. Not according to consumer advocates or the state equivalent of a food and drug administration (Statens legemiddelverk). Its medical director, Steinar Madsen, said there are no special challenges tied to buying such products in Sweden and that they are exactly the same as in Norway. Gunstein Instefjord of the Norwegian consumer council (Forbrukerrådet) said the pharmacy industry has had a problem clarifying and justifying its high prices in Norway, since Sweden also has taxes and especially since there are few nationwide chains. Prices vary little from one Norwegian pharmacy to another, even after Boots of Great Britain entered the market a few years ago. Jostein Soldal, communications chief for Norway’s national pharmacy association Apotekerforeningen, admitted that the price differences between Sweden and Norway can seem large. He nonetheless claimed there was “hard competition” among pharmacies in Norway and between the pharmacies and other vendors of non-prescription products, like grocery stores. “Here, as so often, it’s the market that decides,” Soldal said on behalf of the pharmacies’ owners, while confirming that they (the owners) can freely set their prices. Swedish pharmacies also have larger offerings of generic brands on non-prescription pain relievers, for example, while in Norway only higher-priced name brands like Paracet or Ibux are sold. 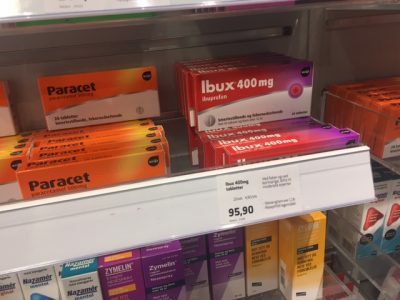 Ibux in Norway, meanwhile, can cost more than five times the price of generic ibuprofen in the US, where a bottle of 100 200mg tablets costs around USD 4 at a high-volume discount store like Costco or Walmart. In Norway, just 20 200mg tablets of Ibux cost NOK 45 at a large Coop grocery story in Oslo last week, or USD 5.30 at current exchange rates, and that’s with an unusually weak krone. A package of 20 400mg Ibux tablets cost NOK 95.90 (USD 11.30) at Apotek 1 and exactly the same at Boots. Instefjord of Norway’s consumer council was not convinced by Soldal’s explanation, claiming that “such large price differences” between Norway and Sweden alone “is cause for concern over whether competition in Norway is good enough.” He urged consumers to be price-conscious, shop around and compare all options. They could also demand more generic, non-brand options.